Fly fishing and Light Tackle Spinning in the waters of Stuart, Florida. Welcome to Pleasant Bay Charters, located in beautiful Stuart, Florida. Situated on the Treasure Coast at the junction of the Indian and St. Lucie rivers, we offer limitless opportunities to cast a fly or throw a lure to a myriad of florida's most desirable gamefish. Whether it is sightfishing on beautiful sand and grass flats, working the mangrove pockets, probing the surf line on the endless outer beaches, or working cruising fish outside the reef line, we can provide you with a trip that will last in your memories. 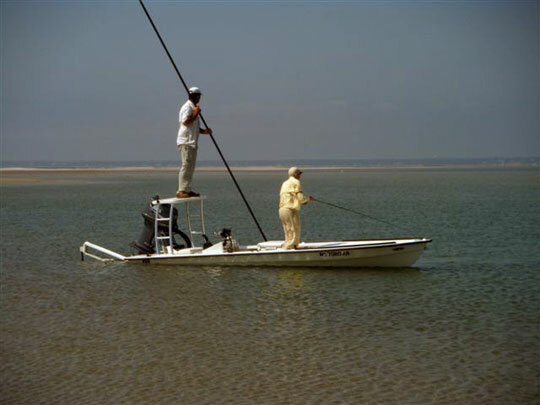 Flyfishing for Tarpon, Snook, Redfish, Trout, Jack Crevalle, and even a chance at Bonefish and Permit, as well as numerous other gamefish are some of the inshore species. Nearshore and offshore species include False Albacore, Spanish Mackeral, Cobia, Large schools of Jacks, and Dolphin.